At the restaurant, sliced peaches and figs, as well as slim honeydew melon wedges were seared over a wood fire, but at home I used a stovetop grill pan. (A good, heavy skillet would also work.) I combined these colorful fruits with arugula and pieces of cream filled burrata, all dressed in a balsamic honey vinaigrette. Thin prosciutto slices shaped into rolls, and toasted pecans made fine finishing touches. Initially I enjoyed this salad as a first course, but I quickly realized that the dish is so bountiful that it could also serve as an entree. Pair it with a light soup or a sandwich if you want a more extensive menu. To prep the fruit and dressing, count on 30 minutes or more, but much of the work can be done ahead. You can whip up the vinaigrette the day before, and slice and grill the fruits several hours in advance. At serving time, you’ll need only to assemble this extra special salad from Cape Cod. 2. For the salad, prepare the fresh fruit. Drop the peaches in a pot of boiling water to cover for 40 to 50 seconds. Remove with a slotted spoon and when cool enough to handle, use a sharp paring knife to remove the skin. Cut each peach into 6 wedges and set on a large plate. For the honeydew melon, scoop out and discard seeds. Then cut the melon lengthwise in half and remove the peels with a sharp knife. Cut each of these halves into 6 slim wedges. Halve the figs lengthwise. 3. Either spray a stovetop grill pan or a large, heavy skillet generously with canola oil or use a brush to coat with oil. (It is essential that the grill or skillet be well oiled so that the fruit does not stick when cooked.) When pan is hot, add enough peach wedges to fit comfortably in a single layer and cook until grill marks appear (or when lightly browned if using a skillet) on the bottom, 1 to 2 minutes. Turn and cook on other side for 1 to 2 minutes. Remove to a tray or large plate and continue to cook remaining peaches in the same way, spraying or oiling the pan often. 5. To assemble, have ready four dinner plates. Cut each burrata into 6 pieces. In a large bowl, toss the arugula with 3 to 4 tablespoons of the dressing and mound in the center of each plate. 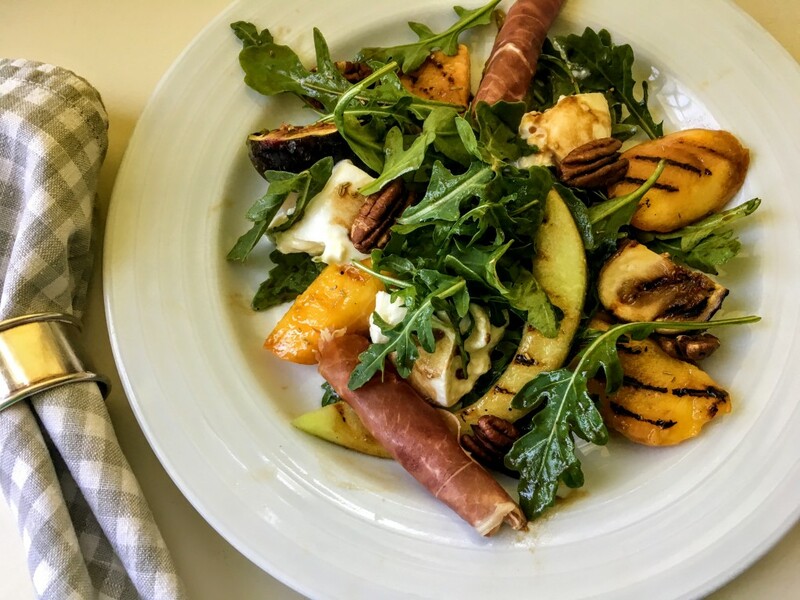 Drizzle the grilled peaches, melon, and figs lightly with some dressing and arrange around and on top of the arugula. Drizzle the burrata with some of the dressing and spoon 3 portions of the cheese onto each salad. Garnish each serving with two prosciutto rolls and with some pecans. Serve extra vinaigrette separately. Serves 4 as a main course. Market tip: McCormack’s sells crushed dried rosemary that is available in many groceries. Cooking tip: To toast pecans, spread on a rimmed baking sheet, and place in a preheated 350 degrees oven until lightly browned 5 to 8 minutes. Watch carefully and stir once or twice. Remove to cool. This entry was posted in Food News and tagged burrata, Cape Cod, figs, peaches, salad, summer by brosbottom. Bookmark the permalink. Betty. This recipe looks delicious. Thank you for creating a recipe we can try! Meantime I’ve a question for you. 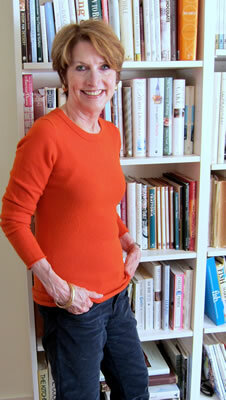 Florence Frabricant had a recipe in the NYT THAT CALLED FOR hot-smoked salmon. What is this & can it be bought in a store like Whole Foods? I googled the recipe for hot-smoked salmon & frankly it’s more involved than I’m ” up” for. Hi Sue, Hope you’ll try the salad with your family. You can leave out the prosciutto for the vegetarians. Here’s a link from Fine Cooking to explain the difference between hot and cold smoked salmon (what you see most often in the groceries and shops). My Whole Foods sells hot smoked salmon (usually in small amounts of 6 or more oz) in their fish dept. Wow, Betty, this looks fabulous! Coincidently, I have peaches and burrata on hand! I’m going to make this on Sunday! Oh, and I recently made your Green Bean, Shaved Fennel and Walnut Salad which is one of our favorite summer salads!!! So glad you’re planning to make the salad! I hope you’ll like it as much as my family (my grand daughter and husband both loved it) and my cooking assistants!